The laxity within a multiple-ligament injured knee has been a conundrum for the clinician and researcher to be able to reliably and reproducibly quantify. Furthermore, once a method of quantification has been established, there needs to be a defined degree of laxity for which physiologic and pathologic laxity can be differentiated. When these goals are accomplished, the clinician is then equipped with the information necessary to determine how and when to intervene, and the researcher is capable of utilizing this data to study outcomes. There are numerous methods available to provide quantification of laxity including stress radiography, a multitude of arthrometry devices, and laxiometers. The current literature has extensively examined the evaluation of the ACL and to a certain extent, PCL laxity. However, the MCL, LCL, and posterolateral corner remain relatively understudied in regard to quantifiable measurements. The ACL may be reliably assessed with stress radiographs utilizing the Telos device to apply force to the anterior tibia, or with KT-1000 and GNRB arthrometers. Exam of choice for the PCL, MCL, and LCL remains the stress radiograph employing various stress techniques and instruments such as the Telos device and S-type load cells. Rotatory instability such as in the case of PLC injuries may be assessed using rotationometers such as the LARS device or with stress radiography. 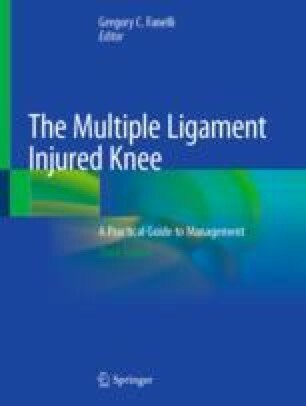 There are promising new devices for examining the multiple-ligament injured knee such as MRI-compatible devices like the Porto Knee Testing Device, computer-assisted devices as well as quantifiable computer-based visual tracking of the pivot-shift maneuver with KiRA. These newer methods have yet to achieve widespread usage, but may be on the precipice of expansion. Overall, these devices to measure laxity remain an adjunct in the diagnosis and treatment of the multiple-ligament injured knee. The physical exam and MRI remain mainstays in diagnosis and treatment plan algorithms.